For years, Daniel Smith suffered from bouts of acute anxiety, extended episodes without any apparent cause that seized control of his body and mind, leaving him an emotional wreck. Sleep was impossible and headaches and nausea haunted his days. Anxiety threatened his sanity and jeopardized his relationships. He had a prestigious job, a comfortable apartment, and caring friends-but, according to his therapists, nothing seemed to be wrong. 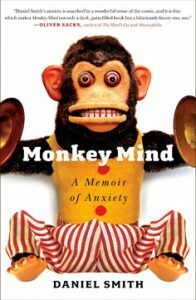 Now in paperback, Monkey Mindis the story of how one man finally learned to live with-and laugh at-his own anxiety issues. Smith shares his own hilarious and heart-wrenching story from his first severe episode at age sixteen to his discovery of the author Philip Roth, who made anxiety seem noble, to his first job, which nearly drove him to distraction, to his struggle to give up the endless cycle of hand-wringing angst in order to keep the love of his life. Through medication, endless psychoanalysis, self-imposed isolation, and meditation, Smith finally makes peace with his restless mind and becomes the husband and father he longs to be. Whether you suffer from clinical anxiety or an overdose of modern life in our “Age of Anxiety,” Monkey Mind’s combination of wit, candour, and serious advice will help you live in the moment instead of inside your own head. Buy on Amazon or your nearest library.